Brittany Hillman of Pleasanton CA defeated Kelsey Muther of Wichita KS 212-203, to win the girls scratch singles division of the 2012 JBT Las Vegas Main Event, hosted by Texas Star Lanes. #7 Kaitlin Mayall opened up the bracket-style stepladder finals with a 222-194 win over #6 Breanne Mattson. In simultaneous action, #5 Lindsey Ailport edged fellow Arizona JBT regular #8 Kayla Goad 188-180. In round two, Mayall rolled on with a 213-209 squeaker over #3 Holly Harris, while #4 and 2010 champ Elise Bolton beat Ailport 182-172. The top seeds then came in for the semifinals and defended their seeds, with #2 Hillman routing Bolton 258-204, and top seed Muther stopping Mayall 223-186 to set up the 1 vs. 2 title game. The title match was well bowled and tightly contested the whole way. After Hillman finished, Kelsey, a two-time previous Main Event finalist, needed 28 pins in the tenth to break through into the winner's circle. 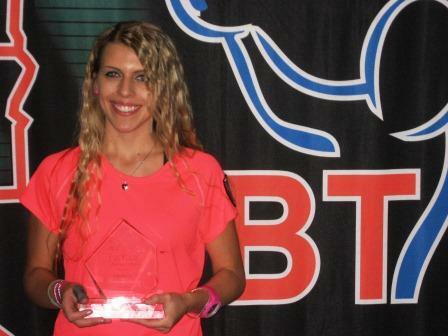 After a great first shot, the second was not to be, giving Brittany the dramatic win, first JBT title, and $1,500 top scholarship prize.